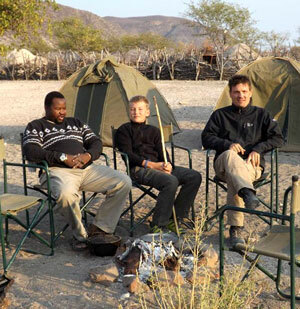 What makes our tours different is our unique connection and insight into the country and its people..
Omuhimba Safaris is based in Windhoek and is a Namibian owned, tour-operator company started by Gerson Uatjavi Kasona, a young Namibian man of the Ovahima people. Gerson is one of a very few local guides in Namibia who has learned to speak French. He has over 12 years of experience in the industry, having worked for several companies, before starting off on his own. He knows the country like the back of his hand and is passionate about sharing its beauty and introducing its beople to others, offering his own personal and unique insights in the countrys rich cultural heritage. Gerson was born in Kaokoland on the edge of the ephemeral river known as the Hoanib. Most of the tours he conducts go as far as his place of birth. Here you'll find a range of free roaming desert adapted wildlife, from the desert adapted elephant, which is the largest land living mammal, lion, hyena, zebra and oryx, to the smallest Southern African antelope, known as the dik dik. Gerson speaks French, English, Afrikaans, Otjiherero, Damara Nama (a click language) and a little Oshiwambo. Thus he conducts his tours in English and French, and when visiting the villages is able to do the translations himself. Omuhimba Safaris offers a variety of tour options, and also gives tailor made tours which better suit the needs and desires of the customer. Omuhimba Safaris conducts exclusive tours taking clients to some of the remotest areas in Namibia, particularly the north western part of the country, in order to explore rarely visited places. Our clients are accompanied by our experienced guides who have an in-depth knowlede of the fauna and flora in these particular areas as well as of the locals living in this part of the country.